The official documentation for this is easily available but maybe not so easy to understand by everybody. This guide is intended to be the most straightforward way of giving access to a person who uses more than one AWS account. 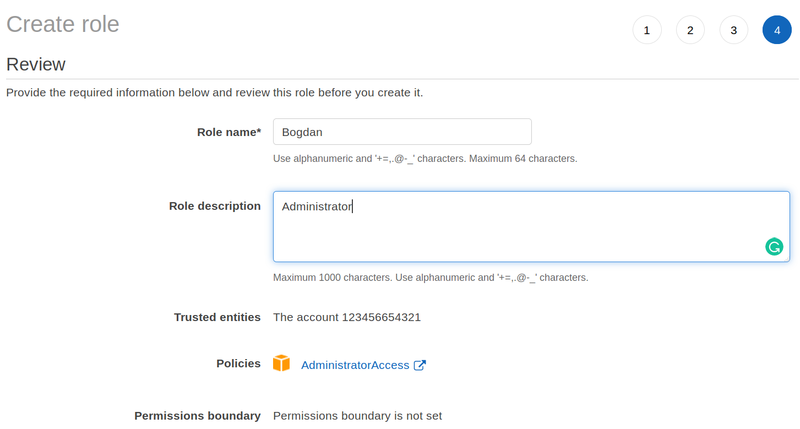 Go to IAM -> Roles and click Create role. Ask for the account ID. Go through each step one by one and select the appropriate permissions. Cases matter. I use Bogdan every time so it’s easy to remember. Click Create role and if you’re only in charge of giving access your job is done. Click your account name from the top right corner and find the Switch Role button. Fill in all the info. Enjoy this faster way of switching AWS accounts. This is a nice time-saving feature which facilitates using multiple AWS accounts. AWS was somewhat late in the game with this feature. Others from my toolbox that support something similar are CloudFlare, GoDaddy and obviously Google.